Expert education catalogue designers – we helped Kit for Kids produce this 128pp catalogue in only three weeks! 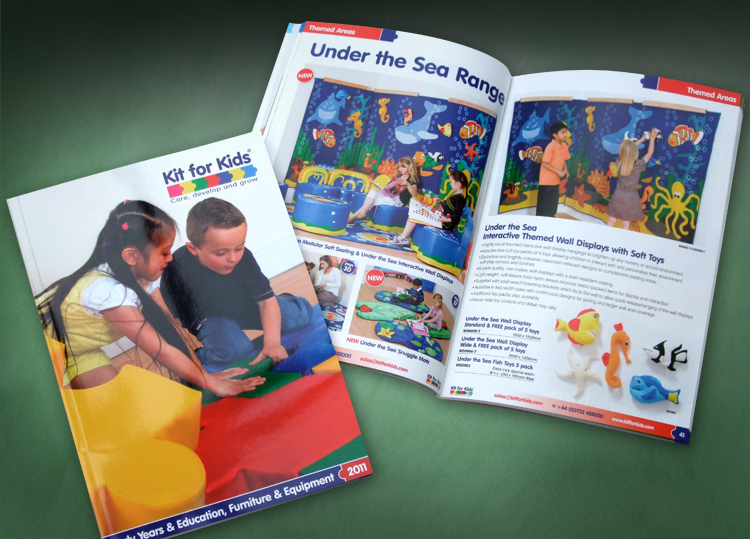 Award-winning education supplier Kit for Kids specialise in soft play, carpets and furniture. When their in-house design team were unable to produce their trade education catalogue in time for an important trade show, we were asked to step to work on their education catalogue design and production. We had only 3 weeks to turnaround the 128 page catalogue from intial brief to finished print ready artwork! Our wealth of education catalogue design experience meant we produced the catalogue on time without sacrificing creativity. Working closely with their marketing department we helped them plan education catalogue design and production, to ensure we could meet their very, very tight deadline. After producing the catalogue design concepts, we then created the page artwork, and supplied the finished print ready artwork to spec exactly as planned. We have worked with an array of education equipment suppliers and manufacturers since we were established in 1999. From famous brands such as Crayola and Sainsburys. To large PLCs such as TTS and Findel. To small specialist companies such as Edusentials and Percussions Plus. If you have tight deadline catalogue that needs producing quickly and when most design companies will struggle, call the education catalogue designers on 01433 208307.